Once you have created a horizon and saved the current session, this horizon will be added to the project database. 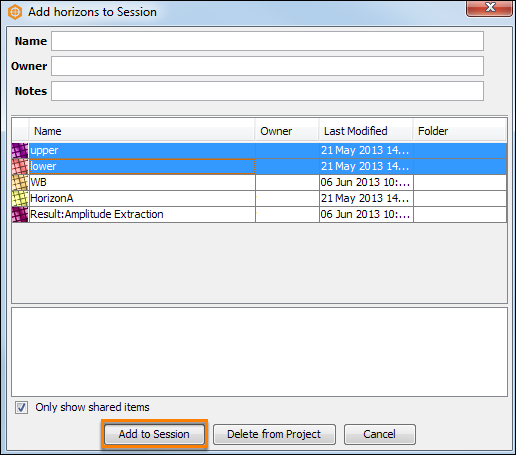 You can add any horizon that is saved in the project database to another session in the same project. 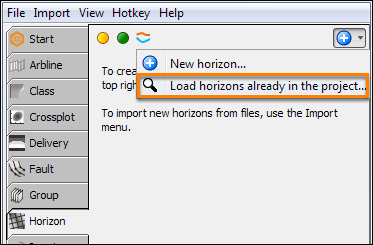 Click the Add icon and click Load horizons already in project. This will display the Add horizons to Session window. The list of horizons in the project database will be displayed in the Add horizons to Session window. Search for the horizons to be added in the session by typing the Name, Owner or Notes of the horizons. Select the Only show shared items check box to display only the horizons that are shared (see Searching and Sharing). By default, this is selected. Select the horizons to be added to the session. When you add horizons to a session, these horizons will be displayed in the intersection mode (intersecting lines in the IL and CL sections) in the 3D View by default. This is because rendering the horizons in the surface mode in the 3D View is computationally expensive. However, you can still view all the horizons added in the session in the surface mode in 3D by clicking the Show whole or intersecting horizon in 3D icon at the tab header of the Horizon tab. 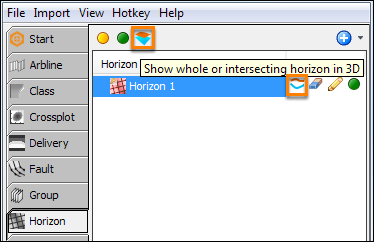 Alternatively, select a specific horizon in the Horizon tree and click the Show whole or intersecting horizon in 3D icon at the item row to view the specific horizon in the surface mode in 3D View.